You have to love leaks. While we less than 24 hours away from the Google event tomorrow in San Francisco, it looks like the full specs of the new Nexus 5X, one of two devices Google is expected to announce tomorrow, have been leaked for the world to see. It’s not a bad device overall and with a starting price expected to be at $329.99, it should certainly get at least a look by those looking for a well designed and developed 5.2″ device. A lot of what are in these specs we already knew or thought we knew but it’s nice to have a bit more confirmation. Probably more interesting is the few things the 5X won’t have on it. As you would expect, the Nexus 5X will be running Android Marshmallow which is also expected to be released tomorrow. It has a 5.2″ display with 1920×1080 resolution, so full HD. That resolution gives you 424PPI so it is easy on the eyes, is protected in Corning Gorilla Glass 3 and has oleophobic coating to keep it finger print resistant. The Nexus 5X is powered by Qualcomm Snapdragon 808 processor and is coupled with the Adreno 408 GPU. It will have 2GB of LPDDR3 RAM and will come with 16GB or 32GB of storage which cannot be expanded (no MicroSD card slot). The rear camera will be a 12.3MP shooter with an f/2.0 aperture. The front camera will be an f/2.2 aperture with a 5MP sensor. It supports Bluetooth 4.0LE, 802.11ac Wi-Fi, NFC and has stereo speakers. Dimension wise it will be 147 x 72.6 x 7.9 mm in size and will weight a comfortable 136 grams. As for other key features, the Nexus 5X will have a fingerprint sensor on the back of the device and will have an Accelerometer, Gyroscope, Barometer, Proximity and Ambient light sensor. It will have a USB Type-C connector and have a 2700mAh battery. That battery may seem small but with the improvements in Marshmallow like Doze, it should give you all day performance. There are a couple of things there that are not mentioned in the specifications and that makes it a little bit of a head-scratcher. First, it does not look like wireless charging is going to be supported in the Nexus 5X. That may or may not be a big deal for some but there has been no mention of it in any leak or rumor I have seen. Also, it does not appear that the rear camera will have Optical Image Stabilization (OIS). This to me is a bigger deal but it isn’t unheard of to not have OIS on a device at this price point. 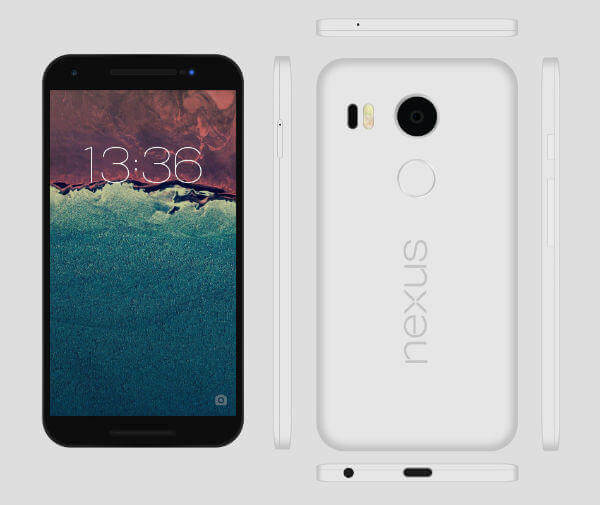 The Nexus 5X is expected to be announced and go on sale exclusively through the Google Store tomorrow. Note that the bands on this device are plentiful so you won’t have to worry about getting a specific model for your carrier. It will effectively work with any of them.